With a distinctly urban influence and a thick outsole in contrasting white, this sneaker is impeccably crafted with premium leathers and has a contemporary silhouette for a modern leisure aesthetic. The lace up closure allows a tailored fit that will hold your foot securely and the inner shoe has been anatomically designed to support each step you take. 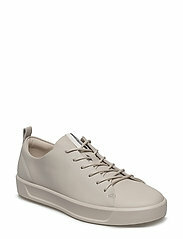 Contemporary sneaker in a rich full-grain leather. Anatomical last shape ensures support for your foot. Premium leather lining is soft and allows feet to breathe. Leather covered inlay sole can be removed to provide extra width. Direct-injected outsole is lightweight and flexible while staying tough and durable. ECCO. Ylä: full grain nahka. Ylävuori: nahka. Ulkopohja: polyuretaani, tpu. Valmistettu Portugali. Irrotettava sisäpohjallinen. Ylimääräiset kengännauhat.